UK, 1954, 76 minutes, Black and white. Felix Aylmer, Diane Cilento, Jerry Desmond, Joe Linane, Sheila Sweet, Philip Gard, Alfie Bass, David Kossoff, Phyllis Morris. 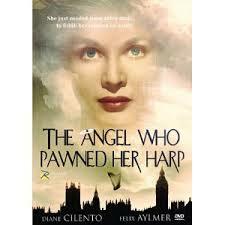 The Angel Who Pawned Her Harp is a pleasant fantasy – more than a touch quaint by now. It was co-written by the screen by the author of the novel, Charles Terrot, who was on the staff of Ealing Studios and who wrote the novel and screenplay for An Alligator Named Daisy in the following year. It was directed by Alan Bromley, his first film, a director who spent most of his career in British television. The film begins with an angel being sent to Earth to fulfil her mission. Because she needs money, she pawns her harp at the shop of Felix Aylmer. She is charming and Diane Cilento gives her both strength and naivety as well as a touch of knowing experience as she goes around changing people’s lives for the better. Aylmer is very good as the Jewish owner of the pawnshop, grown old, with few friends, lonely but who wants to befriend others, especially the local children. Jerry Desmond is a conman. There is a good supporting cast – however, most of them are known only in Britain with the exception of David Kossoff and Alfie Bass. Phyllis Morris gives a marvellously grating performance as Mrs Trapp. The film was made in Islington in the London suburbs and uses effective black and white photography in the actual streets and shops, giving an almost documentary feel to the action. The work the angel has to do is fairly conventional but she does it well, appearing and disappearing, playing the harp sweetly, charming everyone. There is the local policeman and his wife, who had not responded to his love for music. There is their daughter, eighteen, who is sweet on the pawnbroker’s assistant. However, he has no self-image, looks after his mother – and wants to get rid of her grating, gossiping friend. There is also a conman as well as the pawnbroker’s Irish friend. There is a touch of melodrama at times, but the film is generally very sweet. This was one of the earliest films of Diane Cilento. 1.The appeal of the film? British? Sweet? Slice of life? Fantasy? 2.The black and white photography, in the streets of Islington? An authentic feel? The shops, homes, basements, the halls for youth groups, the festival hall? The musical score – especially the Beethoven concert? 3.The opening, the voice sending the angel to Earth, her mission, her harp, needing money, going to the shop, the discussion with Mr Webman? Her getting the money? The irony of her spending it betting on greyhounds? Her going further into debt? Needing three hundred pounds from Mr Webman? Her meeting with Len, going to the dance with him? Encouraging him after he foiled the robbery? Giving him a strong self-image? Meeting the policeman? Talking, playing the harp, encouraging his love for music, his taking his wife to the concert? The Irishman and his support of the angel? Mr Webman and his worries? 4.The character of Mr Webman, the Jewish background, Felix Aylmer’s screen presence, voice? His love for his music boxes? His loneliness, Len as his assistant, Ned Sullivan as his friend and their chats? Going to the pub, talking to Parker, the deceit about the instruments? The music box and its not working? His getting the test on the harp? His interactions with the angel, wary of her? His finally succumbing to her niceness? His giving the talk to the young people, the angel telling him to speak from the heart, his taking them back through history, bringing the theme alive, their response? The finale, feeling tricked because of the harp, the music box working, getting his money back? 5.The angel, her personality, her helping people? The harp, playing? Her interactions? The fact that the harp had very little financial value? Her going back to Heaven – or another mission? Len, helping, his love for Jenny, her not going to the dance with him, going with the angel? Going out with him, the clash? At home, his mother, Mrs Trapp? The robbers and his show of strength? The newspaper? The angel encouraging him, going home and telling Mrs Trapp to leave? Proposing to Jenny? 6.Lane, police work, the conman, the music, the harp, his wife suspicious, taking her to the concert and her enjoying it? Jenny, her age, attracted to Len, putting him off, the clash, reconciliation? 7.The burglars, looking for the safe, the confrontation with Len? 8.The Irishman, genial, supporting the angel? 9.A gallery of London characters of the 1950s – and a more simple time, a time of realism and of fantasy?